Jay-Z Compares Beyonce To Michael Jackson: She's "The Second Coming"
Jay-Z said Beyonce has stuff in common with the King of Pop. 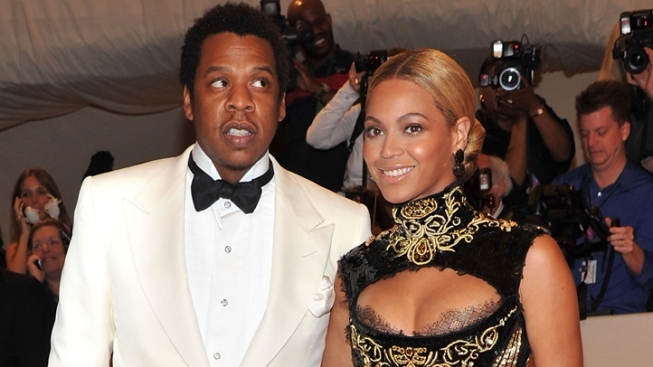 Jay-Z seldom speaks publicly about his wife, Beyonce. But when he does, he goes big! The rap mogul recently called in to a Miami radio station to promote his latest album, "Watch the Throne" with Kanye West, and likened his hard-working Mrs. to Michael Jackson. "You'd have to ask [Beyonce] what she's learned from me, but what I've learned from her is the same thing I've learned from Mike," Jay-Z told Miami's WEDR 99 Jamz last week (referencing the late King of Pop), when asked what he and Beyonce have learned from each other's success. "And I know it's blasphemy to compare the two because Mike was such an innovator, but I think she's like, the second coming." Jay-Z said his superstar wife deserves the MJ comparison due to her fierce commitment to putting on the best show possible for her millions of fans. "The hard work and dedication that she puts into her shows — it just makes you want to work harder at your craft," he said. "She's like a machine." As previously reported on AccessHollywood.com, Beyonce, who turns 30 on September 4, had originally proclaimed she'd liked to have a child by the time she hit the three-decade mark. However, the "Run the World" singer recently told Access she's pushing her motherhood goal back for now. "Forty, that's a good one," Beyonce told Access of her revised baby plan in a new interview on the set of her music video for her latest hit, "Best Thing I Never Had," last month. "Before I hit the age of 40, I'd love to have some children. I would love to direct, continue to learn videos and maybe by then a film, a short film… I love documentaries. "I just hope that I'm happy and into my children and well-adjusted and still making music, if that makes me happy at that time," she added. PLAY IT NOW: Access Exclusive: Beyonce's Second Wedding!